Bill is starring in and executive producing the new half hour sitcom for TBS entitled “The Bill Engvall Show.” The show centers on Bill as the father at the core of a family comedy. The series’ debut telecast on July 17, 2007 delivered 3.9 million viewers and 2.8 million households, securing a place among ad-supported cable’s Top 3 sitcom telecasts (original or acquired) of all time among households and Top 5 original sitcom telecasts of all time among key adult demos and viewers. Bill also hosts one of the top rated shows on CMT, Country Fried Home Videos. This show finds real videos from real people showing what real Americans do bringing the wit and wisdom to television that only the heartland can offer. Bill is currently filming the movie “Bait Shop” which co-stars Billy Ray Cyrus. The story centers around a small town bait shop owner who finds his beloved business threatened with foreclosure. In an attempt to raise the money to save it, he enters a high profile fishing tournament. The film will be released on DVD in the summer of 2008. Additionally, Bill starred in the movie “Delta Farce” with Larry the Cable Guy and D.J. Qualls, which was released on May 11, 2007 and distributed by Lionsgate. This hilarious comedy about three blue collar heroes on the military’s front line is currently available on DVD. Prior to his big screen debut, Bill was one of the stars of the sketch comedy show, “Blue Collar TV,” on the WB network. The ensemble cast included Jeff Foxworthy and Larry the Cable Guy. Blue Collar TV premiered on July 29, 2004 at 8:00 pm. 5.4 million people tuned in to see “Blue Collar TV,” making it the second-most watched show in the time period. He also shot a special for the WB network called “Mobile Home Disasters,” which helped propel the network to one of its best Thursday nights of the season. The show was a blue collar version of “Extreme Home Makeover” and the episode took a deserving family and completely transformed their mobile home. Bill starred in “Blue Collar Comedy Tour, The Movie,” which premiered on Comedy Central and at that time was the most watched movie in the channel’s history. It has sold more than 4 million DVD/VHS units. The sequel “Blue Collar Comedy Tour Rides Again” also premiered on Comedy Central February 13, 2005 and was the 3rd most watched telecast ever for the network. The sequel was released on DVD December 7, 2004 and has sold more than 3 million units. In March of 2006, the Blue Collar boys reunited to shoot Blue Collar Comedy Tour- One For The Road in Washington, DC at the Warner Theater. The movie premiered on Comedy Central June 4, 2006 and was one of the highest rated shows of the year. The soundtrack was released on June 6, 2006 (Warner Bros./Jack Records) and was nominated for a Grammy Award. Along with his Blue Collar movies, Bill also has two solo specials which aired on Comedy Central. “15° Off Cool” aired on March 25, 2007 and was one of the highest rated special of the year. Prior to that, “Here’s Your Sign, Live,” was aired on Comedy Central on August 1, 2004 and premiered to 3.6 million total viewers. The DVD of that special has been certified multi-platinum. Bill is also a platinum recording artist. His first album, “HERE’S YOUR SIGN” (Warner Bros. May ‘96), has been certified platinum and held the #1 position on the Billboard Comedy Chart for 15 straight weeks. It went on to peak at #5 on Billboard’s Current Country Album Chart and reached the Top 50 on Billboard’s Top 200 Album Chart. Collaborating with musician Travis Tritt on a video also entitled, “HERE’S YOUR SIGN,” Bill became a fixture on the play lists of CMT and TNN. The single of the same name became the most requested single on country radio. It was ranked #1 on Billboard’s Country Singles Sales Chart for ten weeks and reached the Top 30 on the Billboard’s Singles Sales Chart, which covers all genres of music. The “HERE’S YOUR SIGN” single also achieved Gold status, not a common occurrence in the comedy market. In 1997, Engvall won the “Best Selling Comedy album” award at the annual NARM convention, outselling albums by Chris Rock and Adam Sandler. Bill has also written several books, including his autobiography “Bill Engvall –Just A Guy” from St. Martin’s Press on May 15, 2007. A native of Galveston, Texas, Bill moved to Dallas and was working as a disc jockey with plans of becoming of a teacher. While in a nightclub one evening, Bill decided to try his hand at stand-up comedy and quickly found that making people laugh was truly his forte. Soon after, he decided to move to Los Angeles to pursue television opportunities. First there was a Showtime special, “A Pair of Joker’s” with Rosie O’Donnell, followed by Bill hosting A&E’s “Evening at the Improv” and several appearances on both “The Tonight Show” and the “Late Show with David Letterman.” In 1992, Bill won the American Comedy Award for “Best Male Stand-up Comedian.” After appearing in episodes of “Designing Women,” Bill went on to portray Buck Overton on the ABC sitcom, “Delta”, starring Delta Burke, thus solidifying his status as a sought-after comic. Bill also starred in the NBC series, “The Jeff Foxworthy Show”, where he played Jeff’s best friend. Bill resides in Southern California with his wife and two children. Do you want to hire Bill Engvall? Directly request a quote. In 48 hours we can send you the availability of Bill Engvall If you would like to book Bill Engvall, Entertainment Booking Agency is the right place. 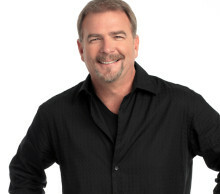 We will offer you the best price and contact the management or we directly contact Bill Engvall. For corporate appearances or speaking engagements you can contact our agents and the will help you true the process. Tags: hire Bill Engvall, Bill Engvall booking, book Bill Engvall, Bill Engvall appearances, find more information on booking Bill Engvall for appearances, Bill Engvall speaking engagements, Bill Engvall endorsements/spokesperson, Bill Engvall appearance fees, Bill Engvall booking agency contact info, biography of Bill Engvall, Contact an artist booking talent agent find a speakers bureau that can book Bill Engvall, speaker booking agency for Bill Engvall, Bill Engvall booking agency, Bill Engvall booking for corporate event. EBA is one of the biggest entertainment booking agencies in the World. We book hundreds of celebrities, artist, athletes and speakers in a year. Important to know is that we are not claiming to be the management of Bill Engvall. We are not the official agent for Bill Engvall. Companies from around the globe book these artists and speakers true our company be course we have one of the biggest networks and we always have direct contact with the artist or the management. We help you to find the right celebrities for your corporate of private events. Please contact one of our agents to get free advice and we will help to get the world-famous artist on your party.